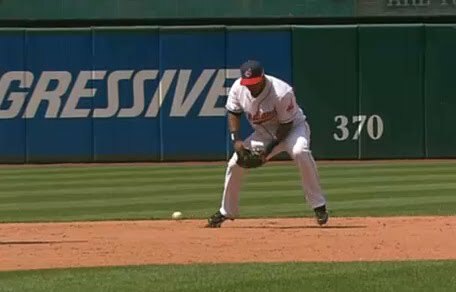 In honour of Cinco de Mayo, I’d like to personally thank Cleveland Indians shortstop Luis Valbuena for turning what should have been a game-ending ground out, and helping spark the Blue Jays 4-3 comeback win. Olé to you, sénor! It could very well have been a tribute to Roger Dorn from Major League, but the Blue Jays will take whatever lucky bounces they can get because it seems like the past few seasons, the Baseball Gods haven’t been kind to the Jays in close games. Happy Cinco de Mayo, and once again … Olé! The Jays are basically the team from Major League this year. Fred Lewis as Willie Mays Hays, John Buck as Jake Taylor, Vernon Wells as Pedro Cerrano, Kevin Gregg (or maybe Brett Cecil now) as Rick Vaughn…you get the idea. Wow – the similarities are very eerie. I just might have to go into greater detail in a future post about the parallels between the Major League Cleveland Indians and the Toronto Blue Jays. Hats … for bats. Keep bats warm. I do love the Dorn reference, but I'm not sure about best sports movie ever Aquamelli. It is definitely top 5, but I think Bull Durham and Slapshot finish above. Also, it was at 5-4 win. Lewis is a bad comparison for Willie Mays Hayes – His entire game was based on speed! If Carl Crawford played center field, that would be a better comparison. Aquamelli and Matt CC, I will go as far as to say that Major League is my favourite sports movies. Its definetely one of if not THE best baseball movie. Mattt, they have been so unlucky at times that its not even funny. Whenever the Jays play in Cleveland, I have flashbacks to that triple play against them. Steve, I don't know if I'd say that Crawford is the equivalent of Willy. Maybe somebody like Michael Bourne (not related to Jason Bourne incidently). The best baseball movie is Eight Men Out. That's just the way it is.